But how does it exactly work? 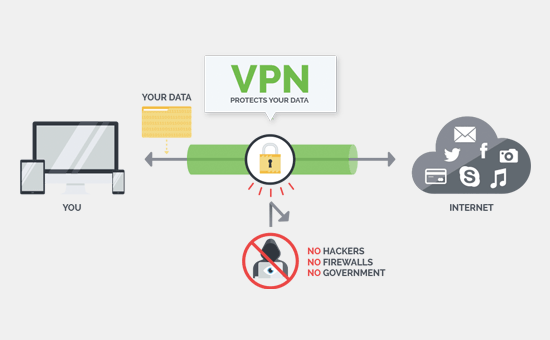 Here’s how a VPN works for you, the user. You start the VPN client (software) from your VPN service. This software encrypts your data, even before your Internet Service Provider or the coffee shop WiFi provider sees it. The data then goes to the VPN, and from the VPN server to your online destination — anything from your bank website to a video sharing website to a search engine. The online destination sees your data as coming from the VPN server and its location, and not from your computer and your location. Though it’s the standard, this sort of connection has some flaws. All of your data is out there in the open, and any interested party can peek at what you’re sending. The internet is a collection of servers responsible for storing websites and serving them to anyone who wants to view them. Those servers talk with each other all the time, including sharing your data with each other to ultimately let you browse a page. Great for you to be able to surf, but not great for privacy. Going online is like taking a commercial airline flight. The ticket agent, baggage handlers, security personnel, and flight attendants all need pieces of data to get you routed between cities. A similar exchange of information happens on the web. If it’s just a fun website that you’re looking at then no need to worry. It doesn’t matter if someone sees your data. But if it’s online banking, business email, or anything else that’s a bit more sensitive — it’s a different story. No one can (easily) identify you or your computer as the source of the data, nor what you’re doing (what websites you’re visiting, what data you’re transferring, etc.). Your data is encrypted, so even if someone does look at what you’re sending, they only see encrypted information and not raw data. The limitations of the type of VPN technology used by a provider. Legal and policy limitations affecting what can be done with that technology. The laws of the country where the server and the company providing the VPN are located and the company’s own policies affect how the company implements this technology in their service. PPTP (Point-To-Point Tunneling Protocol). This is one of the oldest protocols in use, originally designed by Microsoft. Pros: works on old computers, is a part of the Windows operating system, and it’s easy to set up. Cons: by today’s standards, it’s barely secure. Avoid a provider if this is the only protocol offered. L2TP/IPsec (Layer 2 Tunneling Protocol). This is a combination of PPTP and Cisco’s L2F protocol. The concept of this protocol is sound — it uses keys to establish a secure connection on each end of your data tunnel — but the execution isn’t very safe. The addition of the IPsec protocol improves security a bit, but there are reports of NSA’s alleged ability to break this protocol and see what’s being transmitted. No matter if those are actually true, the fact that there’s a debate at all is perhaps enough to avoid this as well. OpenVPN. This takes what’s best in the above protocols and does away with most of the flaws. It’s based on SSL/TLS and it’s an open source project, which means that it’s constantly being improved by hundreds of developers. It secures the connection by using keys that are known only by the two participating parties on either end of the transmission. Overall, it’s the most versatile and secure protocol out there. Generally speaking, most VPNs allow you to select the protocol you use. The more secure protocol you connect through (OpenVPN, IKEv2), the more secure your whole session will be. Unfortunately, not all devices will allow you to use all these protocols. Since most of them were built by Microsoft, you’ll be able to use them on all Windows PCs. For Apple devices, you will come across some limitations. For example, L2TP/IPsec is the default protocol for iPhone. And Android … well, Android has some problems of its own, which we’ll get to later on. The encrypted data is only readable by someone with the original key used to encrypt the data. Modern encryption algorithms work on this principle, with the second step being very complex and worthy of doctoral- level research. What you need to look for is your data being encrypted with the AES algorithm of at least 128 bits. Many of the top VPNs out there go a step above that and offer AES-256 encryption. Your VPN can be super secure, but it all comes down to the connection protocol the encryption mechanism used to handle your information. All good VPN companies will do everything they can to protect your data, your privacy, and your overall security on the web. Keep in mind that they’re still subject to the law in the jurisdiction they’re in, which can affect their service. Depending on the local law of the country where the VPN was established, the company may be forced by court order to share whatever records they have regarding your activity — and there can be international agreements between countries to share information in these cases. If you do enough research, you may find a VPN established in a country that doesn’t have any such agreements in place with your country. In a word, yes. But not always. First off, VPN as a concept is somewhat new in “legal years,” so not all jurisdictions have managed to keep up. This means that the rules are murky and can be interpreted in many ways. Generally, VPNs are often not okay in China, Turkey, Iraq, United Arab Emirates, Belarus, Oman, Russia, Iran, North Korea, and Turkmenistan. Does a VPN Make Me Fully Anonymous Online? Without a VPN, your connection is fully open, and your ISP, the cafe WiFi router, any server along the way, or a person with the right tools can look at your data. Using a VPN solves many of those problems by encrypting your transmission and making it appear as if it’s the server itself that’s making the connection and not you. Investigate the following to help determine the extent of your anonymity. Does the service keep logs? The jurisdiction under which the VPN is established. In some cases, they might be legally forced to keep records. What happens when a government comes asking questions? Is there sufficient encryption and a secure connection protocol? Any such logs make you a tiny bit less anonymous since your IP can be connected to a given browsing session that you had. Of course, tying this to you personally is very difficult but still kind of doable if some agency is deliberate enough. Overall, the fewer logs your provider keeps the better, with “no logs” the ideal. Running a good VPN service costs serious money — robust servers, data transfer, infrastructure, employees, and so on. If the service is offered for free, consider what compromises may have been made. Are they logging activity for their own reasons? Are they displaying their own ads? Is your data being sold to a third party? Then, there’s the VPN’s own policy regarding torrenting and how it’s handled. Most of the quality VPN solutions in the market will allow torrenting. When it comes to the security aspect of torrenting, it all comes down to the VPN’s policies regarding things like logging or sharing your user data. In general, if a VPN doesn’t keep logs overall they also don’t keep them for your torrent activity. Another aspect worth considering when choosing a VPN for torrenting is the download speeds that the service can offer. Of course, this sort of information can be hard to come by; most of the time you only find out after you buy the VPN. Can I Use a VPN to Watch Netflix and Hulu? Yes. But like with most things on this list, it all comes down to the specific VPN that you use. The problem with Netflix overall is that even though it’s now available in over 130 countries, not all shows are distributed equally. Due to complicated licensing agreements that were established before Netflix’s big international rollout, various TV stations retain the rights to even some of Netflix’s own shows, which effectively prevents Netflix from legally making those shows available on their platform. Complicated legal stuff, but VPNs can help here. The way Netflix and Hulu block some of their content in parts of the globe is based on location filters. Meaning that if you’re in a country that’s banned, you’re banned. VPNs make this easy to fix. Since you can select the server that you want to connect with, all you need to do to unlock certain Netflix shows is connect to a server in a country where that show is available. Does a VPN Work on SmartTV? Your smart TVs are yet more things that require a live internet hookup to provide you with their goodies. And with that, a VPN can help you keep those streams private so that only you and the service itself know what you’re watching. configure it right on your router – effectively protect your whole home network and everything that’s connected to it (we will cover this in the next section below). How Do I Install a VPN on My Router? Installing a VPN on your home router is the best way to make sure everything that’s connected to that router is put through a safe VPN connection. In that scenario, you no longer need to install individual apps on your mobile devices, laptops, smart TVs or anything else with web access. First, make sure that your router is compatible with VPNs. This can be done on the website of the manufacturer that produced the router. Often, most DD-WRT and Tomato-boosted FlashRouters are compatible with VPNs. The specific steps involved in setting things up differ from service to service. Your specific provider likely has a dedicated section on their website devoted to explaining how to carry through with the process. Installation is simple and involves you logging in to your router and then filling out a couple of standard forms — nothing you won’t be able to handle. Even though Tor and VPN are fundamentally different, they can still be used together for maximum security and online privacy. VPN gives you access to one server at a time. One of the good things about Tor is that you can use it 100% free and there are no built-in limitations to that free version. All you need to do is grab the official Tor web browser. Once you have it, you just need to fire it up like your standard Chrome or Firefox browser, click the connect button, and you’re up and running. Enable your VPN connection normally. From this point on, everything that involves communicating with the web goes through your VPN. Open your Tor browser and connect with Tor. At this stage, you have the VPN connection and the Tor web browser running at the same time. The main downside with such a setup is that it’s going to be much slower than your standard, VPN-only connection. Tor on its own slows down your experience noticeably, and when combined with a VPN, the results can be even more dramatic. On the plus side, it gives you super privacy, which is a huge plus. A kill switch is a feature that automatically kills your internet access if the encrypted, safe connection should ever drop. If there’s any connectivity issue at all, the kill switch will trigger and block all activity until the secure connection returns. If your VPN doesn’t have a kill switch and a connectivity issue arises, it’s probable your device might attempt to restore the standard, unprotected connection, thus exposing what you’ve been doing up until that point. IP leaks are a known vulnerability with some setups people use to access the web. It’s not entirely a VPN problem at its core. IP leaks can happen when your VPN fails to hide your actual IP as you’re browsing the web. For example, you want to access a geo-restricted show on Netflix, so you change the server to an approved country and reload the page. Then you realize that the content is still blocked. This means that your real IP might have just been leaked. It hides your activity from anyone who might be interested in it. It hides your location, enabling you to access geo-blocked content (e.g. on Netflix and other sites). Helps you keep the connection protected when using a public WiFi hotspot. Overall, use a VPN if your web privacy, security, and anonymity are important to you. As predictable as this may sound, we really see no good reason not to use a VPN if you’re taking your online security and privacy seriously. VPNs are incredibly useful as another layer of security on top of SSL protocols on websites, having a good antivirus program, not downloading shady software, not sharing too much private information on social media, and so on. Overall, they’re your next step towards using the web more consciously and with sufficient precautions set up. There are not many downsides to them. Perhaps the only one being that your connection can sometimes slow down. After all, you’re routing your data through an extra server.